Brands can now partake in Facebook Groups. 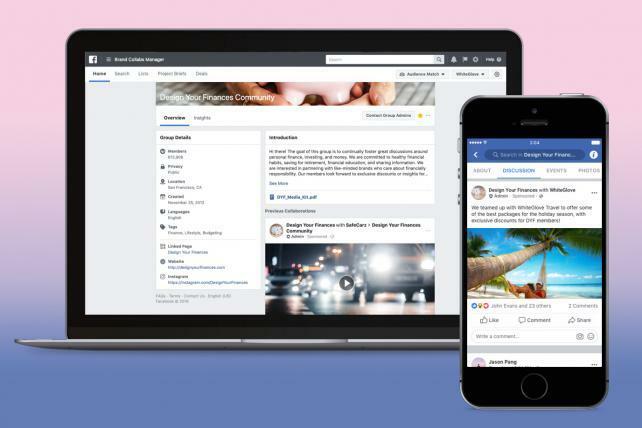 Facebook released new features that gives Pages the power to join Groups, which means publishers and brands can officially participate in the group activity that is increasingly becoming a core focus for the company. On Wednesday, Facebook announced a slate of new tools, including the ability for Pages to participate in Groups, which are the private communities built around shared interests. Groups have been a feature on Facebook since 2010, but brands' Pages were not allowed to engage with people within their own personal communities. Pages are the official accounts for brands, publishers and small businesses, separate from personal accounts. "When we talk about Groups, we are talking about community," say Alex Himel, VP of business products at Facebook. "In the real world, businesses are part of the community." Before now brands and publishers have participated in Groups through the personal accounts of people in their companies. Facebook pointed to Peloton, the work out brand, which has seen its instructors interact with Groups to build relationships with potential clients. Himel said there are a number of brands that could benefit by joining the communities, like travel brand could engage with a travel group or a beer brand could chat with a group devoted to spirits. In the past year, as Facebook has tried to fix the platform, it prioritized Groups as a constructive activity on the social network, connecting people on the service in positive ways. Facebook shows more messages from Groups in the News Feed, too, so they have a better chance at reaching people. Meanwhile, Facebook has limited the ability for videos to go viral, clickbait articles and spam as it cracked down on the type of activity that polluted the platform, especially during the 2016 U.S. election. In reaction to public dissatisfaction with the increasingly toxic atmosphere, CEO Mark Zuckerberg promised to promote better ways of sharing like Groups. Not that Groups are perfect. They have also been abused by bad actors to organize misinformation campaigns and other nefarious activity. Still, for publishers and businesses, Groups can help corral a more committed fanbase, one that is more invested than the average follower of a Page, who often can't be reached en masse without paying for an ad. Publishers like Group Nine's The Dodo and BuzzFeed have created Groups to serve niche interests. There are 90 million businesses and nonprofits with Facebook Pages, according to the social network. On Wednesday, Facebook also announced a new unified messaging system for businesses to communicate with customers on Instagram and Facebook from the same place. Now, businesses can manage direct messages from each platform from their Facebook Page. WhatsApp, also owned by Facebook, is not integrated with the messaging system, yet. CORRECTION: An earlier version of this story said that Pages from publishers and brands could not create Groups until now. In fact, the Pages could not join private Groups run by individual users, but they had the ability to start their own Groups. The story was inaccurate because of information provided by Facebook that has since been corrected.